She genus losserey 'sy chynney Brassicaceae eh Brassica. T'eh goaill stiagh ymmodee troaryn beaghey, myr sampleyr caayl, caaylag, ny caayl blaa. Ta'n genus dooghyssagh da'n Oarpey heear, Yn Veanvooir as yn Aishey tempreilagh. Ta ymmodee dooieyn ry-akin er feie ny cruinney myr troar ny sarkil. Shimmey dooie Brassica t'ad jannoo ymmyd jeh myr bee, as shen çheet er fraueyn (nappin), gish (kohlrabi), duillagyn (cabbish vane, caayl jiarg), blaaghyn (caayl blaa, caaylag) as rassyn (marrag). Ta cretooryn elley gee ad chammah, myr sampleyr praddagyn foillycan. Ta ram biomane C as frauaig ayndaue, chammah's stooghyn kemmigagh elley t'ad credjal oddagh cooney noi anlheiltyssyn, myr sampleyr indole-3-carbinol as carotenoidyn. Ta 3,3'-diindolylmethane ayns Brassica ny woaneyder mie y chorys ym-yeenaght, agh t'eh ny noi-androgen myrgeddin. B. oleracea: caayl, caayl blaa, caaylag a.r.e. ↑ Broccoli chemical's cancer check. BBC News (2006-02-07). Feddynit er 2010-09-05. ↑ How Dietary Supplement May Block Cancer Cells. Science Daily (2010-06-30). Feddynit er 2010-09-05. ↑ Breeding Better Broccoli: Research Points To Pumped Up Lutein Levels In Broccoli. Science Daily (2009-11-08). Feddynit er 2010-09-05. ↑ Omar I. Vivar; Chia-Lei Lin, Gary L. Firestone & Leonard F. Bjeldanes (2009-09-01). "3,3'-Diindolylmethane induces a G(1) arrest in human prostate cancer cells irrespective of androgen receptor and p53 status". Biochemical Pharmacology 78 (5). Elsevier. doi:10.1016/j.bcp.2009.05.008. ↑ Le HT; Schaldach CM, Firestone GL & Bjeldanes LF (2003-06-06). "Plant-derived 3,3'-Diindolylmethane is a strong androgen antagonist in human prostate cancer cells.". Journal of Biological Chemistry 278 (23). doi:10.1074/jbc.M300588200. PMID 12665522. 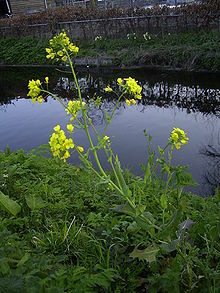 Ta tooilley coadanyn mychione Brassica ry-gheddyn ayns Wikimedia Commons. Hie yn duillag shoh er ny reaghey er 9 Mayrnt 2013, ec 14:09.